All are invited to join in the FREE #Dungarvan1215 Treasure Hunt to celebrate the 800th anniversary of Dungarvan and learn more about our remarkable town. This fun recreational activity is open to all ages and is free to enter. It should take about 45 minutes to complete walking. 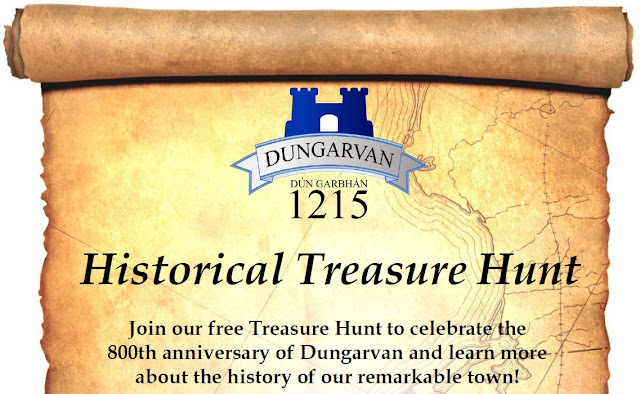 It all takes place in Dungarvan's Medieval quarter around King John's Castle & The Old Market House Art's Centre. Entry Forms with clues can be can be downloaded on this site or collected from Dungarvan Tourist Office, Main Street at any time. Return your entry form before 4pm on July 4th 2015 to be in with a chance to win. Entries To: Dungarvan Tourist Office, Main Street, Dungarvan.